Translation apps on mobile devices sure come in handy when you’re travelling to different countries where you don’t know the local language. But usually they use the internet to perform their translations, which means you need to go online to get help communicating with people or deciphering restaurant menus. We have recently released an offline version of our Yandex.Translate mobile app for iPhone and iPad. So now this application can work without connecting to the internet, saving you the cost of internet roaming or the trouble of finding a wi-fi hotspot. Yandex.Translate can be installed from App Store for free. After that, just go to the settings and choose the language pair or pairs that you need to translate to and from, and download the translation database onto your device. Five language pairs with English are available for offline translation: English-German, English-French, English-Italian, English-Spanish and English-Russian. If an English-speaking user is travelling from the UK to Spain, they’ll only need the English-Spanish offline translation database to get by day-to-day, while the other language pairs will only be available online (the app warns about this). After returning home to the UK, the user can delete the English-Spanish offline translation data to free up space. While we’re on the subject of space and size, we really went to great lengths to get the balance right. As you might know, statistical machine translation is based on searching and indexing parallel texts on the internet. We look for already translated texts and phrases, compare them with the original and rank them according to how often they occur. You can read more about that here. These parallel texts, phrases and word combinations are quite cumbersome, taking up gigabytes on our servers. For the translation app to work offline, we had to streamline the parallel translation database, so that only the most common translations remained. 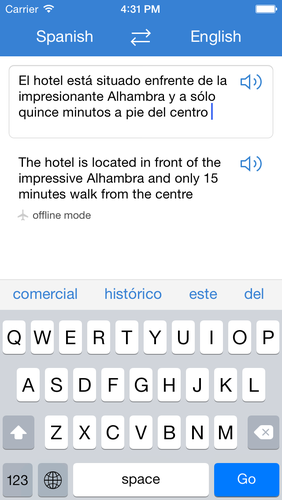 For example, if the full translation database gives 100 different ways to translate “where can I get the best tapas in Barcelona” into Spanish, the mobile version will retain only the 10 most commonly used translations. We understand that this kind of streamlining can lower the quality of offline translations, and solving this problem was our biggest challenge. We ran a multitude of different tests and experiments to determine the optimal database size that would retain an acceptable translation quality for offline mobile gadgets. For every kind of translation, the optimal size turned out to be 500 MB. Larger (that is, with the addition of more translation variations) brings insignificant improvements to quality, even if the size is multiplied. And reducing the size and the number of translation options causes serious loss of quality without freeing up much space. Yandex’s offline translation app can help users in daily life situations in foreign countries, whether they’re on vacation or a business trip: telling a taxi driver where to take them, comprehending what’s on a menu, understanding what street signs and warning signs say. These are the situations in which mobile translation apps are most often used. Our statistics also show that Yandex.Translate is used in private correspondence, school homework and university assignments, for reading tourism guides or news on the internet, for translating recipes, poems and songs. The average length of translations on mobile devices is five to seven words. At present, Yandex.Translate handles about 400,000 translations on mobile platforms every day. Most of our users are in Russia, but we are working on making the app popular outside our home country. Since we first announced it in December 2012, the capabilities of mobile Yandex.Translate have grown enormously: it now “knows” 44 languages, offering a text-to-speech function for some – meaning it not only translates a phrase from your native language into a foreign one, but also lets you hear how it sounds when spoken.